Italian Greyhounds are small sighthounds. Their name comes from their popularity in Italy during the Renassiance when they were bred as ladies’ companion dogs, although there is evidence that dogs almost identical to the Italian Greyhound existed in Egypt up to 2,000 years ago! Many of the Italian Greyhounds that we re-home come to us because they have been sold by commercial breeders who haven’t painted an accurate picture of what it’s like to live with these little dogs and the new owners just can’t cope. Italian Greyhounds are affectionate, bright, intelligent and curious little dogs who will find things to do if you don’t provide adequate entertainment. Sounds cute? It can be. At other times it can be very inconvenient. Italian Greyhounds crave human attention and need interaction throughout the day – play time, walks, short training sessions and of course quality lap time. They do not cope with living outdoors and they don’t cope with being left at home all day while their humans go off to work. They can be difficult to house train, will only think about obedience when it suits them, and will soon let you know what they think of you trying to be the boss. They have been bred as companion dogs which means that their desire to be with their humans is very, very strong. If you are looking for a dog to be your companion and be with you through the day, every day, then an Italian Greyhound might be for you! A healthy, happy Italian Greyhound is full of energy and needs a good hour-long walk at least once a day, preferably twice. They can run at jaw dropping speeds, and leap like gazelles which can get them into trouble. 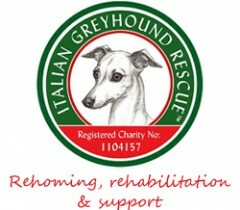 If an Italian Greyhound falls while running at full speed they are at risk of serious injury including leg breaks that (i) are extremely difficult to set and treat, and (ii) can cost £4000 – £6000 in vet’s fees to fix. Italian Greyhounds are not small Whippets, more like “small Whippets on Speed” – they are full of stamina well into their old age (the breed has an average life span of 12-15 years). Italian Greyhounds all over the world have a game that they play in the home called the “Iggy 500” also known as ‘the zoomies’, ‘mad hour’ and ‘carnage’. If you want a quiet little house dog, the Italian Greyhound is not the breed for you. Consider too that you will need to “IG-proof” your home. Italian Greyhounds are small but they can leap like Gazelles. Kitchen worktop – no problem. Child stair gate – a mere hop. If you have wooden floors you will need to think about how to stop your Italian Greyhound from skidding – they like to jump on and off furniture whether you like it or not. Jumping onto a shiny wooden floor where their legs could go from under them on landing could be another disastrous leg break situation. When they’re at home and not creating mischief (shredding loo paper, re-arranging your linen basket, hiding your socks, etc. ), they are never happier than in your lap or settled down next to you on the sofa. Italian Greyhounds are ace hunters quite capable of bringing back a freshly caught rabbit or squirrel but they’re also very much lap dogs – without the fluffy coat! Italian Greyhounds have soft, satin-like, short-haired coats and shed imperceptibly which is a definite plus point. The down side of this is that with such fine coats and very little body fat these little dogs feel the cold. These little dogs are creatures of comfort and need jumpers and rain coats in colder weather. So what you might save in dog grooming fees you will almost certainly pay out in shopping for essential kit. 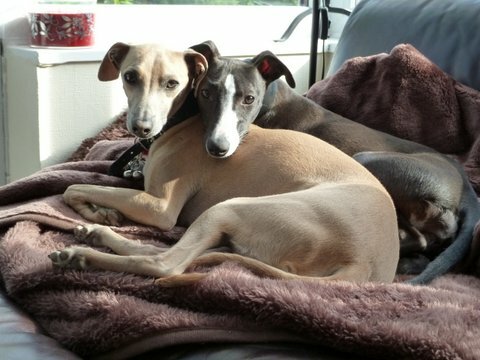 Italian Greyhounds are generally a sociable breed and will get on with most of other dogs but we do not recommend having Italian Greyhounds with large, powerful dogs – simply because a big dog has the potential to do a lot of damage to an Italian Greyhound. Imagine a friendly Boxer dog playing with a tiny Italian Greyhound – one playful leap landing on the Italian Greyhound’s back could lead to broken legs at best and an Italian Greyhound that has to be put down at worst. Italian Greyhounds are a joy but at a cost – they are high maintenance in almost every aspect of their lives! If you are considering bringing an Italian Greyhound into your home please make sure that you do your research thoroughly and make sure that the Italian Greyhound is right for you, and that you are right for an Italian Greyhound.